The Machine Shed’s Baked Potato Soup is legendary. If you aren’t lucky enough to live in Mid West, you may miss this amazing potato soup. But, you can recreate this soup at home. The Machine Shed is a well-known restaurant in the Mid West. The Machine Shed is known for the delicious MidWest style of cooking. What does that mean? Fresh ingredients, home-style cooking, lots of vegetables, and hearty dishes to fill the appetites of hard-working people in the Mid West. My family is from Missouri, so this is an area of the country that always reminds me of growing up. The Machine Shed serves items like brisket filled potato skins, homemade cinnamon rolls, delicious fried chicken, and so much more. 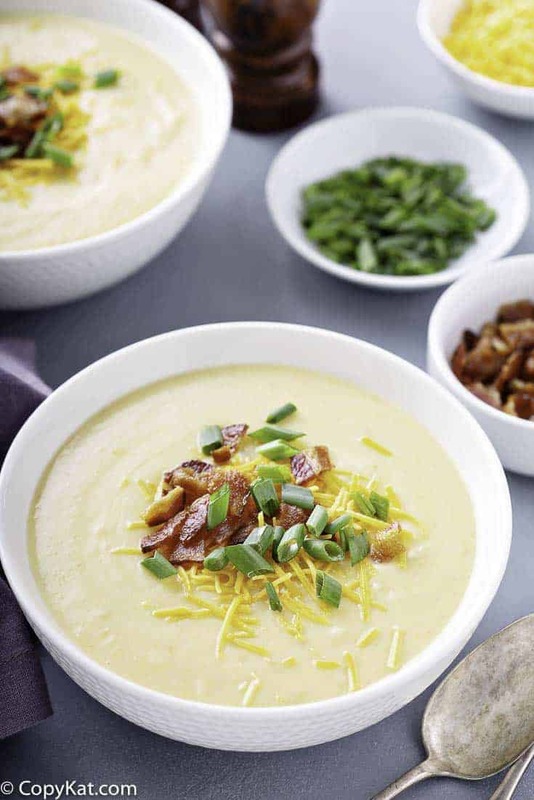 This baked potato soup is one of their specialties. What makes this soup so unusual is that it uses red potatoes. The red potatoes are much more firm that Russet potatoes. They use heavy cream in the soup for full body. By using heavy cream that means this soup reheats very well. 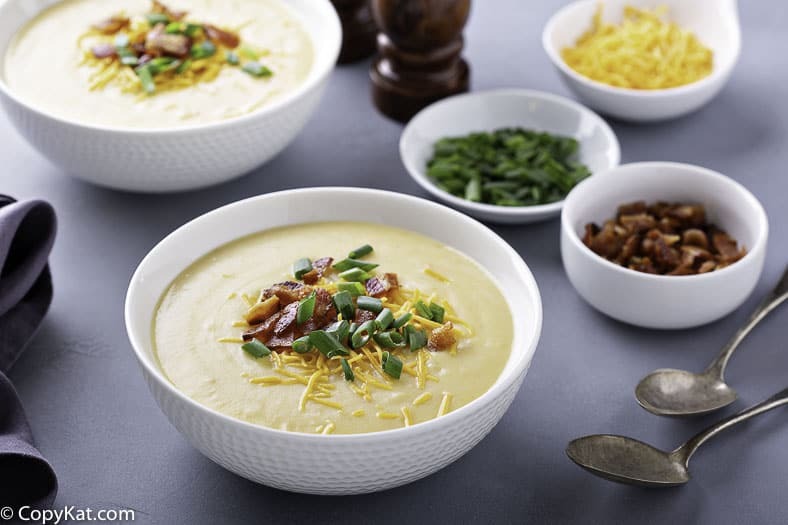 Looking for more great potato soup recipes? Be sure to try some of these. 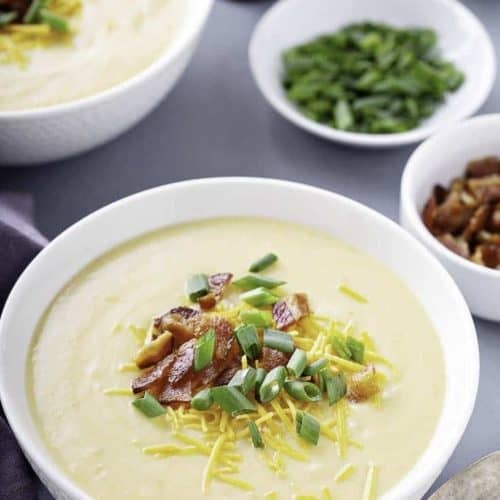 You can make a copycat version of the Machine Shed's Baked Potato Soup. Boil Potatoes in water for 10 minutes. Drain and set aside. In a large, heavy pot, saute bacon, onions, and celery over medium-high heat until celery is tender. Drain bacon grease and return bacon, onions, and celery to pot. Add milk, water, chicken base, salt and pepper. Heat over medium-high heat until very hot. Do Not Boil. In a heavy, large saucepan, melt margarine and add flour (called a roux). Mix well. and allow to bubble, stirring for 1 minute. While constantly stirring soup, add the flour & margarine mixture (roux) slowly. Continue stirring soup until thick and creamy. Stir in potatoes and parsley. Serve while hot. Garnish with shredded Colby cheese, fried bacon bits, and chopped green onions or all three. My personal suggestion: all three is the best. YUM! It is now the yardstick that I measure potatoe soup!! DOUBLE YUM! This is called "Baked Potato Soup" but the potatoes are boiled! Why?! I believe it gets called baked potato soup because of the addition of sour cream, cheese, and bacon. In the US we tend to serve baked potatoes with sour cream, cheese, bacon, and more. Sadly, some restaurants boil large potatoes and call them baked potatoes too.